Paradise Group is not an unfamiliar name in Singapore, along with Crystal Jade and Imperial Treasure. 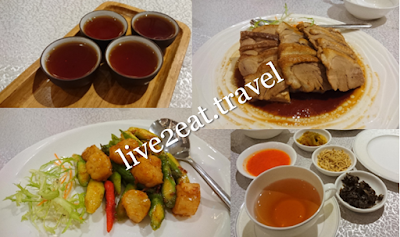 About a year ago, it opened Paradise Teochew Restaurant on the 3rd floor of Chinese Swimming Club's Sports Complex at Amber Road. Its 2nd branch, also on the 3rd floor, took over the space previously occupied by Crystal Jade Pristine at Scotts Square. As we were there for dinner on a weekend, did not have a chance to try its dim sum. Instead, we ordered braised sliced duck (Irish fat duck) and sautéed scallop with asparagus in XO sauce. The former came atop surprisingly good braised beancurd, was tender and not as salty as the latter. Lightly flavoured without being bland, and not too oily. While I had these dishes with plain white rice, a dining companion ate porridge with condiments and another tried its sliced pomfret porridge. Nothing to rave about or fault, and overall a pleasant experience.